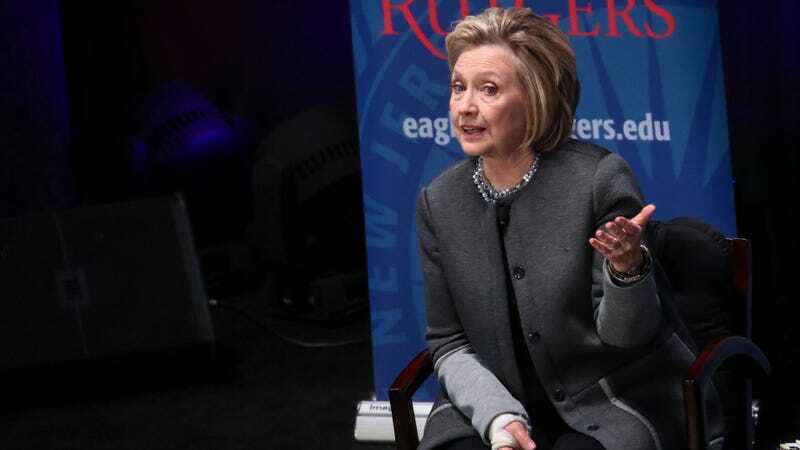 Hillary Clinton spoke at an event at Rutgers University in New Jersey on Thursday night, addressing the reaction—hers and the public’s—to her loss in the 2016 election. And when she was asked how she’d respond to critics who told her to “get off the public stage and shut up,” per the moderator’s wording, she seemed less than pleased. Indeed, as Clinton (who was paid $25,000 out of the university’s endowment for her appearance) noted, fellow losing candidates like John Kerry, John McCain, Al Gore and Mitt Romney went on to have illustrious careers after their campaigns fell short. In some cases (i.e. Romney’s) it might have been better had they in fact disappeared into the ether immediately following their concession speeches, but her point stands. Clinton has been criticized for failing to “move on” following her defeat, having repeatedly brought up the people and factors she believes contributed to it—James Comey, Bernie Sanders, Barack Obama, the media, sexism, and Vladimir Putin, to name a few—and whether or not her assessment is correct, it isn’t necessarily helpful at this very moment. The Democrats are making an attempt to gain ground in 2018, an effort that likely won’t be bolstered by a schism between the Clinton and Sanders camps, and a refusal on the former’s part to acknowledge where criticism of her campaign and policies were warranted. So does it behoove a failed candidate to step aside and let the party figure out where it stands? Probably. Are we all very tired of hearing about how the 2016 election went wrong? Definitely. Then again, if my life’s dream was to be President of the United States, and I managed, after decades of trying, to become the first woman presidential candidate, and I was sure I was going to win, and everybody else told me I was going to win, and then the country voted for this idiot and told me to shut up and stay in the woods, I don’t know, I’d probably be mad.